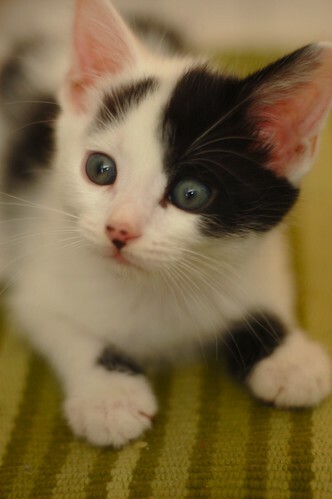 The Itty Bitty Kitty Committee: Our Little Cow Kitty has a Name! Our Little Cow Kitty has a Name! When I first saw this adorable little guy -- all I could think of was Oliver Hardy -- don't ask me why as the black eyebrow mark would seem best suited to Groucho Marx. So, of course, once you have a name in your head, it's really impossible to think of anything else! Well, my dad loved Laurel and Hardy, so I think I am going to go with Oliver for the first name -- and I expect he will be a bundle of laughs (and exasperation) for his new owners (as I believe Oliver was to Stan in the old movies!). And, in honor of Opal and her now famous "5 pennies," let's go with Nicholas as a middle name (even though the derivation of nickel has nothing to do with Nicholas) -- so.... introducing Oliver Nicholas Furman to the world! Nice work, Marcia! Excellent choice. Oliver is an outstanding physical comedian, so it suits him so perfectly! Have a good morning, everyone. I'll be back later today to announce another name. Oliver seems like a great name for this little guy! And oh my goodness he is such a cutie!! Such bright eyes! Yes, Oliver is a perfect name for this little cow kitty! Hooray for Oliver Nicholas! Great job Marcia!! He is just precious. Wonderful name for a remarkable kitty! Hurray for Oliver and a big cheer for the special recognition of Opal (who I'm sure will learn how her five pennies contributed to the naming process). Oliver Nicholas...you are, little one! I love him. And I love the name. Perfect name for a perfect little boy! I love giving my cats a middle name, too. I've had Dusty Rabbit (because her fur was like a rabbit's), Peanut Butter (for obvious reasons), and Cinder (dare I say it..) Ella. Just can't think of anything to go with "Smudge" though.. poor Smudge. Love the moniker on this little guy, seems to fit so very well. Perfect name, indeed! He looks so mischievous - but in a good way! Absolutely adorable. He is shocked, SHOCKED I tell you to have such a distinguished name. Of course he reminded you of Oliver Hardy. His nose dots look like a little Ollie mustache. Those "Don't ask me why. ", gut-level, 1st impressions tend to be spot on. Great call! @ anon, I think "muffin" is the only possible middle name for Smudge. Never fear, Marcia. My tux boy was named Groucho for his little nose mustache. Mr. Marx does not go unremembered in cat-dom (as if this were a concern for him?). Yay for little Oliver Nicholas! Thanks all for the good words! And, now that I see a new picture of him, he looks even more like Oliver Hardy with the nose dots like Ollie's mustache -- as Nanette pointed out above! I think the black and white cow kitty also reminded me of the old black and white films before color took over! Anyway, I just love this little guy and just wish I was in the Tacoma area to give him a forever home! He has stolen my heart! But then, I say that about every bunch of kitties!